Haier is one of the biggest manufacturers of home appliances around the globe. It aims to make life easier with its products and its innovative, premium appliances do just that. Haier fridge freezers offer modern design, reliability and quality, as well as clever tech that makes food storage more efficient and hassle-free. 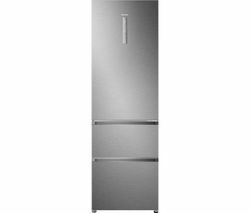 The Haier fridge freezer range gives you plenty of 60/40 and 75/25 double- and multi-door options, as well as larger American-style fridge freezers with water and ice dispensers. The look is sleek and modern, and finishes include cream, silver and stainless steel. Its A++ energy rating models use up to 40% less energy than an A+ energy rated fridge freezer, so you can save on energy bills. Haier’s multi-air flow technology and AirPur food preservation system ensures that your produce stays fresher for longer. Its auto-defrost fridge compartments prevent ice build up and provides even cooling so that there are no warm areas and nowhere gets blocked by chunks of ice. Freezer compartments come with Total No Frost technology to ensure that the freezer section remains frost free, saving you the hassle of ever having to defrost the appliance. By preventing ice build up in the freezer, it maximises your storage space and provides better cool-air distribution throughout the refrigerator. The smart Super Freeze and Super Cool functions can be turned on before you go shopping so that when you get back, each compartment has been cooled to an optimum low temperature, sealing in freshness more quickly. 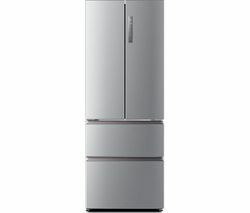 Some Haier fridge freezers also come with ABT lighting, a UV light that eliminates harmful bacteria, as well as MyZone. MyZone is an independent compartment that offers an adjustable temperature of between +2 and -3°C to suit a range of items. It's a great way to extend your fridge or freezer space, especially for items you want stored short-term. For more storage space in the kitchen, take a look at our entire American fridge freezer range, and for cooling power wherever you want it see our mini fridges, perfect for any room.